Q- HOW LONG WILL IT TAKE FOR US TO RECEIVE OUR FINISHED IMAGES AFTER OUR SESSION? A- You should receive your images in a proofing gallery 2-3 weeks following your session. If you would like to rush your images you can do so for a small fee. Q- HOW DOES BOOKING OUR NEWBORN SESSION WORK WHEN WE DO NOT KNOW WHEN OUR BABY WILL BE BORN? A- As babies birth dates can be unpredictable, your newborn session will be booked as soon as your baby is born. I accept a specific number of expecting moms around the same time frame to avoid overbooking if all my client moms were to deliver at the same time. To secure your spot on my calendar I require a signed contract and non-refundable deposit for 10% of your total package. Q- WHEN IS THE BEST TIME TO GET OUR NEWBORN PHOTOS TAKEN? A- I prefer to book newborn sessions between 2-3 weeks of life with the ideal time frame being between days 8-12. That being said, there is no wrong time to photograph your baby so if your baby is slightly older, don’t sweat it! We will still capture beautiful photos of your baby, regardless of their age. Q- HOW DO I KNOW IF A SHORT STORY SESSION OR A SIGNATURE FAMILY COLLECTION IS RIGHT FOR US? A- Short Story Sessions are designed for the family that wants to take advantage of a lower price point and a shorter time frame (30 minutes), and who is flexible on dates/locations. Short Story Sessions are only available on designated Short Story Dates. 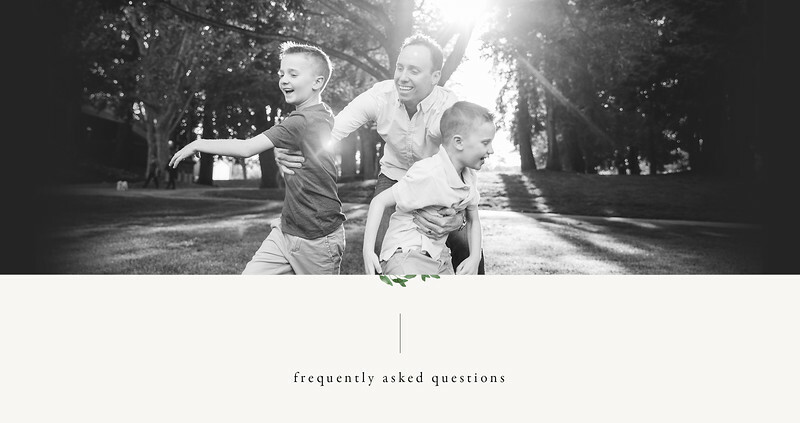 The Signature Family Collection is a good option for the Family that would like a longer session at a location of their choosing on a date and time that works best for their schedule. The flexibility and time allowance of the Signature Collection allows for more room for lighting restrictions, more variety of photos, and an overall relaxed session. With the Signature Family Collection there are more final images and print products. Q- IF MY PACKAGE COMES WITH PRINT PRODUCTS CAN I SKIP THE PRODUCT AND GET A DISCOUNT ON THE PACKAGE? A-The package price remains the same whether you take advantage of the print product or not. The print product is a gift to you, it has not been factored into the cost, but is instead our gift to you for choosing to book with The Wild Bloom Studio. Q- WHAT HAPPENS IF WE HAVE A SICK CHILD? CAN WE RESCHEDULE OUR SESSION? A- Of course! Life with kids is unexpected and sometimes you get sick! Please notify me as soon as possible to reschedule your session and I will do my best to work you in on a later date. However, while I do allow rescheduling for illness I do not allow cancellations with a refund of your deposit due to illness. Q: WILL WE GET A PRINT RELEASE AFTER OUR SESSION? Q: HOW DO WE SELECT A LOCATION FOR OUR SESSION? A: You are welcome to select your own location for your shoot or I can provide you with a list of my favorite locations in the Bay Area for you to choose from. It’s best to look through images online and see what catches your idea to help you decide what your style is and what type of location fits that style. Q: WHAT SHOULD WE WEAR? A: What you choose to wear to your session is up to you! Coordinating outfits with the rest of your family can really make your photos beautiful but is not necessary. Try choosing a palate of 3-4 colors what work well together and layer in those colors in your family’s outfits. Don’t be afraid of patterns and textures! Q: WHAT TIME OF DAY IS BEST FOR LIGHTING? A: The best time of day to do your session is very dependant on the time of year since lighting is very dependant on the position of the sun. As a general rule I like to aim for the first two or last two hours of daylight but ask me for specific advice one time frame when we pick our location. Q: DO YOU EDIT ALL THE PHOTOS YOU PROVIDE US WITH? A: I sure do! Every photo I deliver to you will receive basic editing including color correction, sharpening, contrast and vignetting and should be ready to print. You will also see a few artistic edits in your proofing gallery such as B&W and special color edits. Additional editing is available upon request. Q: WE HAVE SMALL KIDS, HOW CAN WE MAKE SURE OUR SESSION GOES SMOOTHLY? A: Don’t worry! I am very experienced at working with small children and am a mom myself. The best thing you can do is relax and have fun and let me do the rest! Kids pick up on stress and it can make them less likely to cooperate, so leave the entertaining to me and let your kids just be kids! Q: DO I HAVE TO ORDER PRINTS THROUGH YOU? A: I highly recommend ordering prints through my professional vendors, but it is not required. The difference in quality is huge when it comes to ordering through a professional lab, so I encourage clients to order prints through their online proofing gallery. While you are welcome to print elsewhere, I only guarantee prints through my print lab as I am calibrated to their system so if you choose to print elsewhere, do so at your own risk. Q: DO YOU REQUIRE A CONTRACT AND/OR DEPOSIT? A: Yes! In order to reserve your session date and time your will need to send me 10% of the total of whatever package you select along with your contract. Payments can be made via check, cash, or Paypal. Q: DO WE NEED TO PROVIDE OUR OWN PROPS AND ACCESSORIES? A: Feel free to bring any accessories and/or props that you would like me to use. It also helps to send me images that you like so we can try to emulate them or use them for inspiration for your session. This helps me understand your style and what you are hoping for in your own photos so I can prepare and bring the things we need. Q: HOW DO WE TAKE OUR SESSION TO THE NEXT LEVEL? A: I always love the opportunity to make your photos more unique and exciting for you! Whether it be a picnic on the beach or a bike ride in the park- let’s discuss ideas for how we can make your session even more epic and personal!